We are so excited to welcome back one of our TRSM professors, Dr. Andrei Kirilenko as he just returned from serving as the Global Environment Outlook Author/Expert of Climate for the United Nations Environment Programme (UNEP) GEO-6 summit in Nairobi, Kenya. “The Global Environment Outlook (GEO) is a consultative and participatory process to prepare an independent assessment of the state of the environment, the effectiveness of the policy response to address these environmental challenges and the possible pathways to be achieve various internationally agreed environmental goals“ (GEO, UNEP website). Dr. Kirilenko does have a past with the United Nations and the process has taken around 5 years where he began as one of the initial members of the Assessment on Climate of Europe in which a team of experts surveyed Europe to see the steps of environmental protection and opportunities for growth within the continent. This process then led to his position in the Global Environment Outlook where he has been a key member in the overall development and strategics of environmental protection globally. Andrei Kirilenko, Ph.D. is an associate professor at the Department of Tourism, Recreation, and Sport Management at the University of Florida. Dr. Kirilenko’s studies stem back from a Ph.D. in Computer Science from the Computing Center of Russian Academy of Sciences, a M.S. in Applied Mathematics from Moscow State University in Russia as well as his Postdoctoral research titled: US Environmental Protection Agency, Corvallis, OR; European Forest Institute, Joensuu, Finland. Currently, Dr. Kirilenko is increasingly involved in multidisciplinary studies, which include scholars in both natural and social sciences such as political and tourism research. One of the examples of such projects is a study of the difference in attitudes of the US and UK mass-media towards applying the “precautionary principle” to environmental protection. Dr. Kirilenko’s role as GEO author and Expert of Climate for the UNEP GEO-6 summit was integral in the procession of this summit. If any of the UN delegates or members of the secretariat had a question on anything related to climate, it would be sent to Dr. Kirilenko to answer. This conference and summit lasted between January 21st-24th where discussions ranged between greenhouse gases, oceans and coasts, freshwater, etc. 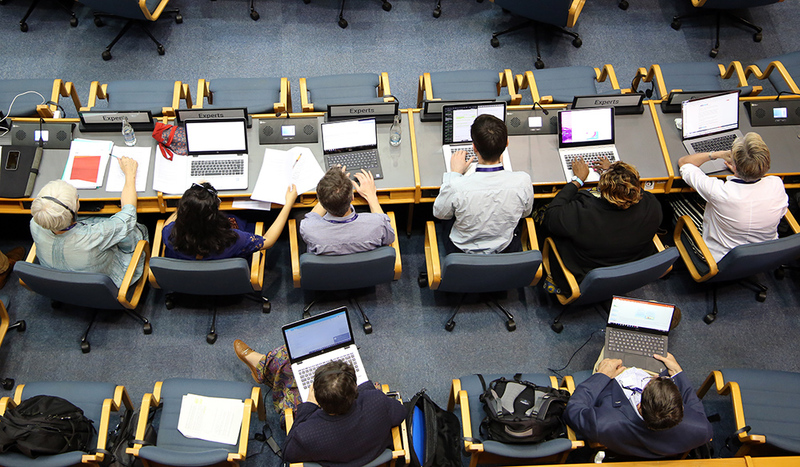 These discussions led to talks on the next steps for the UNEP and GEO-6 groups; such as the need for urgent, sustained inclusive actions on all previously discussed and look more deeply into sustainable pathways. After getting the chance to speak with Dr. Kirilenko, he defines the experience as “eye-opening” as he sat upon the board of the summit full of key members and policymakers with the power to make change internationally. Dr. Kirilenko’s specific focus for this summit was on climate as he was the “Author/Expert on Climate” meaning any delegates, policymakers, or secretariat members were able to forward any questions about climate on to him for response. Some of the biggest takeaways he discussed were the initial surprise at how tedious the process of international negotiations were and how tough these summits are on policymakers. The negotiations part of the summit would last hours in order to pass single paragraphs and points which ended in a 700 page idea proposal. From there the draft is cut down to 42 pages, where it is then reduced to its final form of two pages which will arrive on the desks of key policymakers and offices throughout each country.